After a quick review of food adjectives, the students were shown pictures of many such “strange” foods from around the world, including: llama steak, dried lizards, fried crickets, chicken hearts, roast guinea pig, poisonous pufferfish, fried whole sparrow, duck blood soup, and barbecued bullfrogs. Yummy, right? The students liked it and it also made me think of the many “strange” foods I’ve tried in my life, especially here in Spain. Of the list above, I’ve tried llama steak in Argentina and chicken hearts at the many Brazilian BBQs I’ve been to in Massachusetts. Both are quite good! 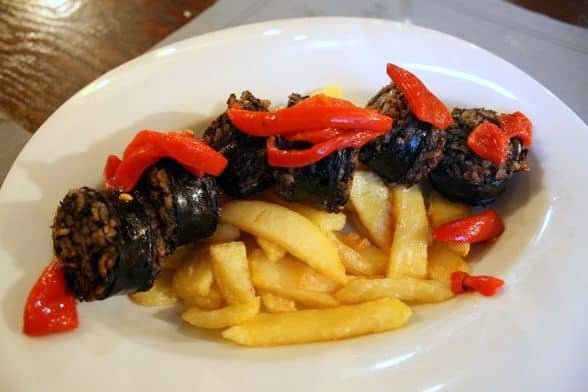 Other foods I’ve tried here in Spain are blood sausage (morcilla), snails, pig fat in many ways, menudo (a garbanzo bean stew made with intestines and other strange cuts of meat), kidneys of some animal, and fried fish egg-sacks. Other foods that some Americans might consider strange, although I do not, are whole prawns (shrimp/prawns in their shell with the head and “vein” etc. ), squid and octopus prepared many ways, the persimmon and cherimoya fruits, and the cold soups: gazpacho, salmorejo, ajo blanco etc. For those of you who hesitate to eat a cold soup, I once did too. I still don’t love gazpacho, which is similar to V8 and usually drank in a glass (update: I now ADORE gazpacho, recipe here!). It’s quite liquidy and more similar to a juice in my opinion. But I love Salmorejo (still do, recipe here!). I started to really like it last year, after only previously trying it once or twice, when someone told me to imagine it as a salad instead of a soup. It worked. The next time it was in our fridge (sent from Ale’s Mom) I was on the verge of heating it up (a cardinal sin and probably quite disgusting as well) when I took a few bites cold. It was amazing. The mixture of the rich and creamy tomato puree, the bits of hard boiled egg, and slices of cured ham are amazing, healthy and filling! I’ve now learned to make salmorejo from Ale’s mom, and this last time it came out great! Here are some pictures and here’s the recipe for those of you who dare. My advice is try it a few times before saying that you don’t like it. And don’t think of it as soup! 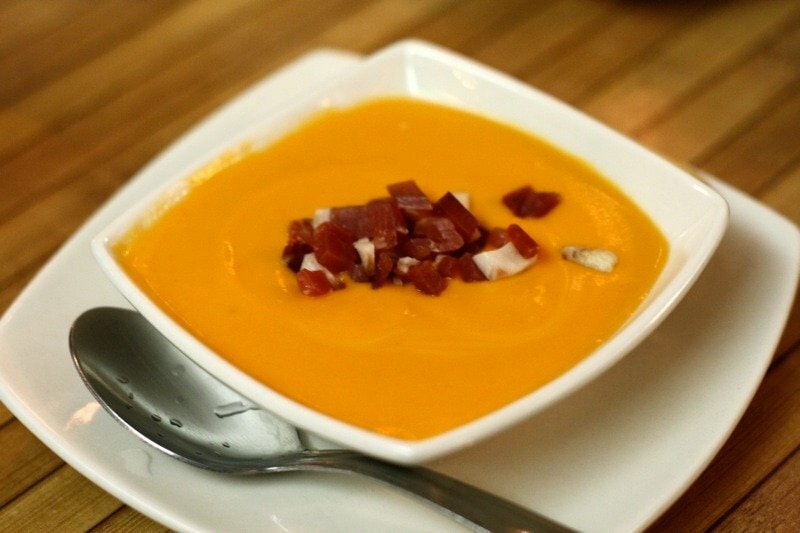 Salmorejo is one of my favorite Spanish foods. 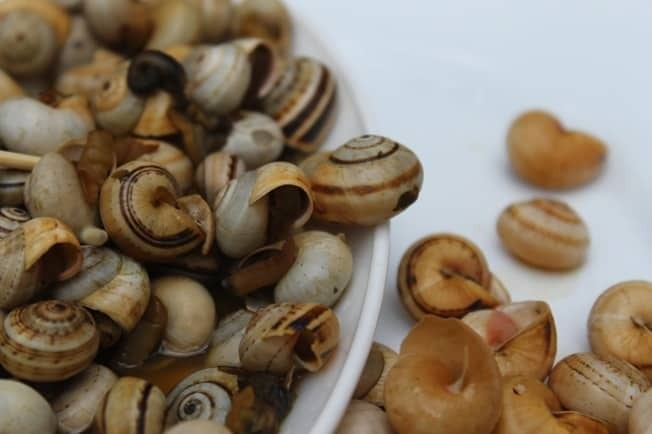 What do you consider strange foods where you are living? 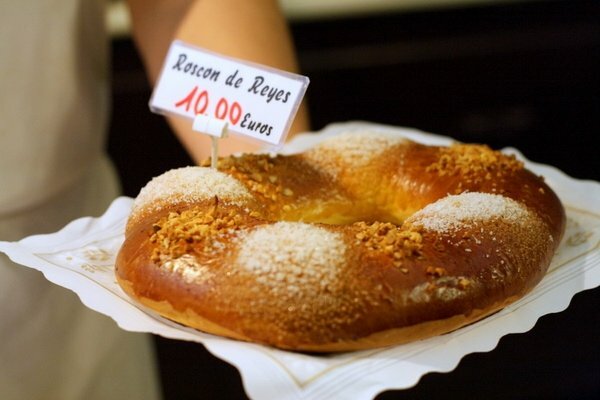 To really experience bizarre foods in Spain, join the Madrid Food Tour Bizarre Foods Tour!